A series of workshops mixing theory & pratice in Mouzieys-Panens (5km from Cordes-Sur-Ciel). Workshops can be taken individually. Every workshop is organised around a specific theme (respiratory system, cold & flu, nervous system, stress, detox, etc…) where we will explore how to maintain the health of our body in relationship to that aspect & how to support the body in its natural mechanism of balance, vitality & defense with medicinal plants & essential oils in the context of a holistic & vitalist family herbal medicine. This is global approach that takes into account the totality of a person but is also highly personalized as it looks into the specific interactions between a plant & a person rather than focusing on the general « this herb for this condition » model (more info here ). There will be a simple theoretical segment where we will explore some basics of physiology, as the more we understand how our body function, the most efficiently we can keep it in a state of health. We will explore plants & plants actions (carminative, nervines, tonic, circulatory, etc..) that have an affinity with the theme of the day. We will explore a few plants in more depth. We will also briefly look into how our psycho-emotional state can also affect our health and how the plants can also support us in that sphere through their physical properties. Practice time will be blended in with some exploration with our senses (tasting, smelling, observing plants – in season- & feel the effects of the plants & essential oils) as well as some reflections on our health & vitality. 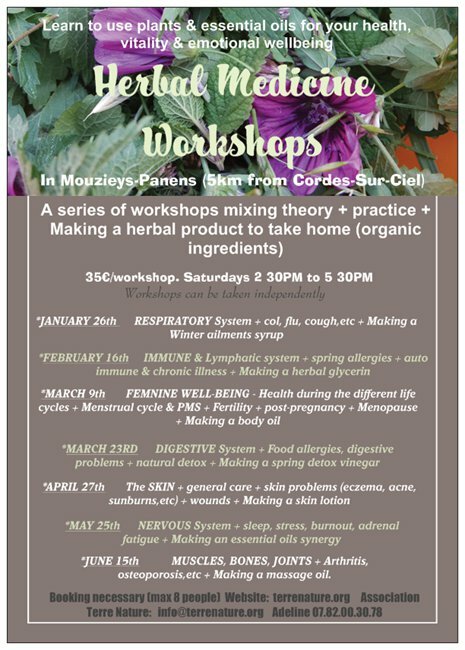 We will end with some medicine making (a different type each time) with plants and/or essential oils that you will take home + you will learn the basics of formulation so that you can continue to make medicines at home. Immunity is at the root of our health and our vitality: we will look at how to keep it in optimal function and what to do when it is deregulated + the plants that can help with the associated symptoms. We will look at what happens when it is deficient (recurrent illness, always feeling tired, lack of vitality) & when it is over-active (chronic inflammation, auto-immune conditions, …) & how to deal with this + we will look in more details at asthma & seasonal allergies/hay fever & protocols to put in place to prevent & alleviate symptoms. We’ll look into the myths & truth around Turmeric, often marketed as THE plant for inflammation – and we will taste golden milk (dairy free), as well as immune boosting energy balls among other things. As usual, we will not just look at plants lists but try to understand what is happening in the body & people specificities so that we learn how to choose the right plant at the right moment and for the right person and experiment with the effects that the plants have on us. We will make a glycerite of your choice (organic ingredients) that you’ll take home: either an immune boosting or a seasonal allergy formula. We will look at the plants that can support women during the different phases of her life & ease the transition periods that can often upset physical & emotional wellbeing + herbal tonic & nourishing plants that can support the feminine reproductive system throughout life. We will look at the menstrual cycle, PMS, panful period, excessive bleeding + Fertility & post-partum care (but not pregnancy) + pre-menopause & menopause: ease the symptoms & prepare the body for it. We will also speak briefly about thyroid health, phytoestrogens & endocrine disruptors. We will also look at plants & products for self-care: for the body, mind & spirit! We will make a massage oil that you’ll take with you. Our general health is deeply influenced by the quality of our digestion & assimilation, which will impact our immunity, vitality & our capacity to eliminate internal toxins (eg: hormones) & external ones. We will see how the digestive system influences our mental & emotional well-being & vice versa (the gut as the 2nd brain) & how there isn’t ONE perfect diet but one that is adapted to each person constitution and specificities, as well as the seasons. We will end by looking at the myth around detoxification & how to support the body in gentle detox with plants, as well as looking at the important function of the liver. We will taste, among other things, an herbal aperitif drink, fermented food, digestive tea + we will make a spring detox vinegar with seasonal plants. We will see what role the skin has for our health & how to take care of it – beauty care but also its health in general – and the importance of the quality of what we put on this biggest organ of the body. We will make a skin lotion adapted to your skin type. Those classes can be offered in a different location/on demand with a minimum of 4 people. Contact me for more info.